One could really choose any of the myriad of coffee stylings from Strictly Organic Coffee Company, but it is the Quickstep that really adds clarity to the modern professorial mind. Quickstep takes the mushroomy, earthy tones of the typical Sumatran cup and ties it into the complex, smokey acidity of the Guatemalan beans. It is a coffee that sharpens the senses while clarifying the mind of the scholar dealing with educating the future of the country in a society where most information is available at the touch of a finger. Also, coffee is delicious and wonderful as are most things in moderation. Strictly Organic Coffee Company, 6 SW Bond St.
As much as most of us love coffee, sometimes it makes that unquiet mind even louder and that body even more filled with jitters. 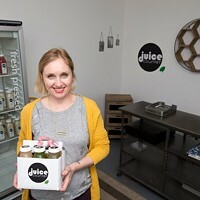 Juice Counter is all about cleansing the body of all toxic stresses and discombobulation from the brilliant minds of the Bend's Makers District. While all six flavors are organic, cold-pressed, raw, and unpasteurized, the Morning Lift Off will most definitely clear the foggy, low energy brain from its doldrums. Combining grapefruit, apple, lemon, ginger, cinnamon, and maca, this juice will make your lack of sleep a forgotten memory. Sleepiness need not be a hindrance any longer. As much as we might love a flickering flame across the printed word, sometimes a stable source of light is needed to make the late night hours shorter. Whether it's for grading papers, writing your own long-gestating work, or delving deeply into a novel whose world will just not let you go, Holcomb makes beautifully illuminating lamps. Lamps whose Quoizel design is not just pleasing to the eye, but whose hand cut pieces of stained glass will improve the quality of any room it lives in. Don't let your light be simple, let it be refined and prismatic. Lone Crow Bungalow, 937 NW Wall St. Sometimes the simplest explanation for a complex concept is the easiest one. With Logicomix and Democracy, these concepts are explained in graphic novel form, which doesn't necessarily make them less complex, just more accessible. Logicomix covers 60 years and focuses on the struggle for the foundation of mathematics, told through the eyes of great thinker Bertrand Russell. Democracy is by the same creative team and combines stunning visuals with the story of the invention of Democracy and how we can keep the concept alive. These books are a truly marvelous way to bring abstract ideas to the modern Millennial's visual mind. 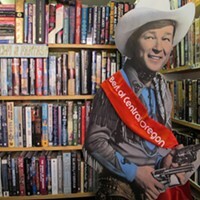 Pegasus Books, 105 NW Minnesota Ave.